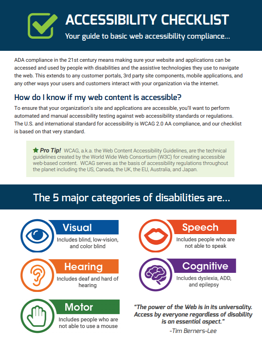 Download our Website Accessibility Checklist and find out! Have you ever wished there was a quick way to find out whether or not your website is accessible? We've compiled a handy checklist of basic tests for some of the most common website accessibility errors. If you're not sure whether your site is accessible or not, this is a great place to start! Fill out the form to access the checklist!